TORONTO, Nov. 21, 2018 /CNW/ - Corby Spirit and Wine Limited is pleased to announce a new limited edition Canadian whisky honouring some of the nation's most treasured professional hockey players. 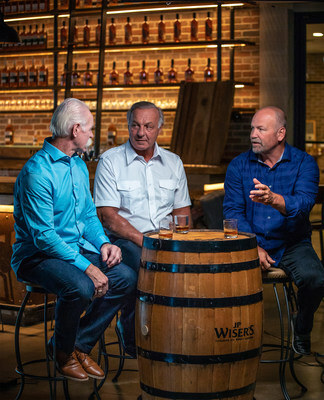 J.P. Wiser's partnered with the NHL Alumni Association ("NHLAA") to celebrate the past in both hockey and whisky tradition by releasing regionally exclusive, limited-release whiskies, with unique blends that reflect the playing styles of Wendel Clark, Lanny McDonald, and Guy Lafleur. In true partnership, a group of NHLAA members visited the home of J.P. Wiser's – Hiram Walker & Sons Limited Distillery in Windsor, Ontario (Distillery of the Year, Canadian Whisky Awards 2018) to understand the craftsmanship behind Canadian whisky with master blender, Dr. Don Livermore. Part of the proceeds from this whisky collaboration will be donated to the NHLAA to support their philanthropic ambitions. "This partnership will help the NHLAA's mandate to support retired hockey players adjust to life after their professional careers end, while also impacting our local hockey communities," said Glenn Healy, former professional league champion and Executive Director of the NHLAA. Wendel Clark – bold and tenacious. Available now, only in Ontario. 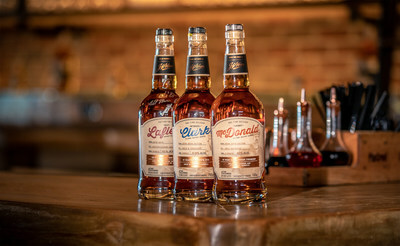 Aged in bourbon barrels for eleven years, this 100% rye whisky is bold and tenacious, just like Wendel's on ice personality. This whisky features notes of orange honeysuckle and dried fruits with a peppery finish. And, at 41.6%, it truly is a Toronto whisky. Lanny McDonald – well-rounded and wheat-forward. Available now, only in Alberta. Whether you have a moustache or not, you can enjoy this 9-year-old, wheat-forward blend. Aged in Canadian and virgin oak barrels, you'll find notes of apricots and fresh honey for a whisky as well-rounded as Lanny's game. Guy Lafleur – smooth, 100% corn, with a memorable finish. Available now, only in Quebec. For 10 years, this blend aged in Speyside, bourbon and rum barrels, leaving it with a naturally smooth and delicate body reminiscent of "The Flower" gliding through the neutral zone. With 100% corn, you'll notice honeycomb toffee, caramel and vanilla on the nose. A drink of this, and you'll be cheering, "Guy! Guy! Guy!" "At J.P. Wiser's, we wanted to pay tribute to our incredible country by marrying two major pieces of its history – hockey and whisky. Thanks to our great partners at the NHLAA and our fantastic Canadian whisky team, what resulted was the Alumni Whisky Series, a unique way to collect and own a piece of history," said Derek Wagner, Assistant Brand Manager, Canadian Whisky, at Corby Spirit and Wine Limited. Consumers won't want to wait to experience the first release of the Alumni Whisky Series because once they are gone, they are gone. Stay tuned for Spring 2019, where we will be commemorating another group of retired professional hockey players with our second release.